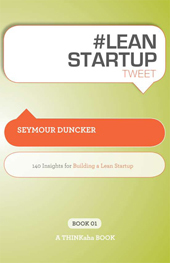 #LEAN STARTUP tweet Book01 | THiNKaha: Become a recognized expert in your field of expertise. Compelling thought leadership content. order now to receive it as soon as it’s published. Building a lean startup in today’s economic environment is exciting and challenging. To be successful, it is an enterprise that demands passion, vision, leadership, and execution. ‘#LEAN STARTUP tweet Book 01‘ provides you with the encouragement, insight, and practical advice you need to create the desire, momentum, and best practices that will keep you going as you build your business. In 140 keen and concise statements, ‘#LEAN STARTUP tweet Book 01‘ provides valuable management advice from a successful startup CEO that will help you discover the tools and techniques necessary to build a successful startup from lean means: Gather tips on successful fundraising for startups. Gain practical insights on risk management. Understand the interplay between passion and vision in launching a new business. Learn how to affect your business’ bottom line by improving internal processes and operational intensity. Whether an entrepreneur, executive, small-business owner, key contributor, investor, or stakeholder in the startup community, you will find that the lessons and inspiration in this book are relevant to most business processes. Author and serial entrepreneur Seymour Duncker has fifteen years of experience in pioneering new markets; he is Founder and CEO of iCharts, a Web 2.0 startup that became successful in the midst of the recent economic downturn. ‘#LEAN STARTUP tweet Book01‘ is part of the THiNKaha series whose 100-page books contain 140 well-thought-out quotes (tweets/ahas). Seymour Duncker is Founder and CEO of iCharts, an innovative Web 2.0 startup that was a TechCrunch50 finalist and is attracting clients like NVCA, YouGov, and Shop.org. Seymour is passionate about making the Web a better place for viewing and understanding data. He is also a serial entrepreneur with more than fifteen years of experience in pioneering new markets. Before launching iCharts, Seymour worked for SAP, worked with two startups, and built a successful consulting firm.